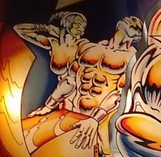 Never noticed this guy on Silverball Mania backglass but he definitely enjoys pinball. Where is her left hand? It's my last day of vacation and the weather is beautiful. Of course I found the myrtle Beach pinball museum. That's how I'm spending my last day! Yeah and where’s that guy’s pants? Pretty sure all he’s wearing is a couple of bracelets. Q: You know you enjoy pinball too much when? Gives a new definition to multiball.